Caesars Palace, the guardians of good taste in Vegas. While it’s changed a lot since the bad old days of the 60’s and 70’s, Las Vegas isn’t known for its subtlety or high fashion. Gaudy is business in Vegas, and business is good. However, even Vegas has its taste limits, and a proposed Walgreens sign violates those limits, mostly due to the fact that it’s a gigantic sign measuring 322 feet wide and 60 feet high. That’s right, kids; Las Vegas casinos are objecting to an animated shopping center sign on a Walgreens because it’s gaudy. 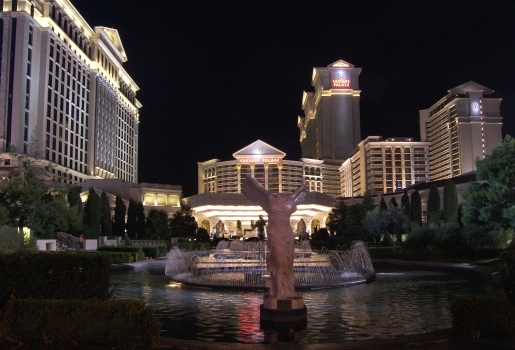 The sign is supposed to be animated and will run along the whole facade of a new shopping center to go up near Caesars. The center’s developers, BPS Partners, are seeking five zoning variances due to the sheer size of their giant sign. It remains to be seen who will win this battle over good taste.